With years of business gifting experience, Murray’s is here to curate the tastiest selections for your partners, clients, and associates. They’ll be thrilled, thanks to you! View our how-to and catalogue below, and get in touch with a gifting specialist today to find the perfect collection for all of your gifting needs! - We put our extensive product knowledge to work to curate unique collections for your recipients! - Add your custom gift message for a personal touch, and a wooden gift crate for an elegant unboxing experience! Browse our curated gift collections via the link to our catalogue, below! Send it back to us at the contact information below. 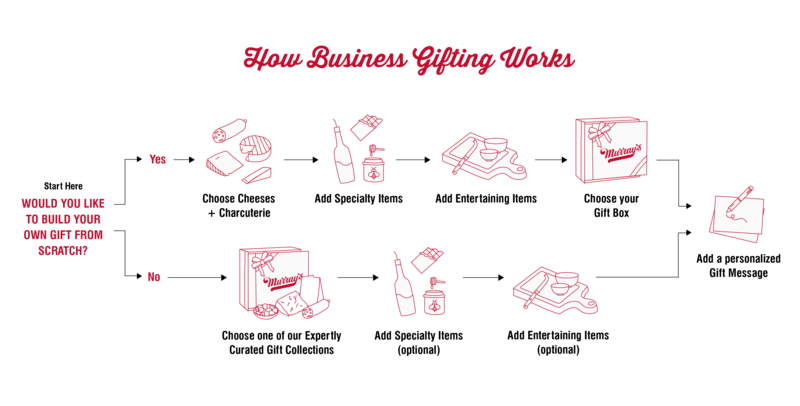 A gifting specialist will reach out to you within 48 hours to coordinate your shipments! We are available by phone and email Monday-Friday between 9:00 am – 6:00 pm. If you reach out after business hours, please leave a voicemail or send us an email, and we will get back to you as soon as we return to the office! For orders placed in advance - please download our Gifting CSV form HERE, fill it out using the guide in the ‘How To’ tab with your recipient information, gift selection, and gift messages - and send it back to gifting@murrayscheese.com. A gifting specialist will reach out to you within 48 hours to coordinate your shipments! To customize a gift, or for questions about multi-gift shipments, send an email to gifting@murrayscheese.com, or give us a call at 212-243-3289 x519. My company needs to send a few (dozen, hundred) corporate gifts to our business partners and clients. Can you help? Absolutely! Please contact our Corporate Account Specialist at 212-243-3289x519 or email gifting@murrayscheese.com to get started. Can I include a gift message or Company card with my order? We are happy to include a gift message with your order. It will appear inside your box that is shipped to your recipients. If you are looking to include a personal company card, please email gifting@murrayscheese.com learn more about this opportunity. Do you have a minimum/maximum for placing an order? No minimum orders here. Happy to coordinate gifts for 1 to 500+ Recipients! We ship in nationwide! Our items arrive within 24 hours of shipping with proper insulation and ice packs. Our items are cut to order and shipped immediately for optimal freshness! Click HERE to learn more about our rates and location. Yes! When your gift is out for shipment, we’ll send you a shipping confirmation email with a FedEx tracking link.